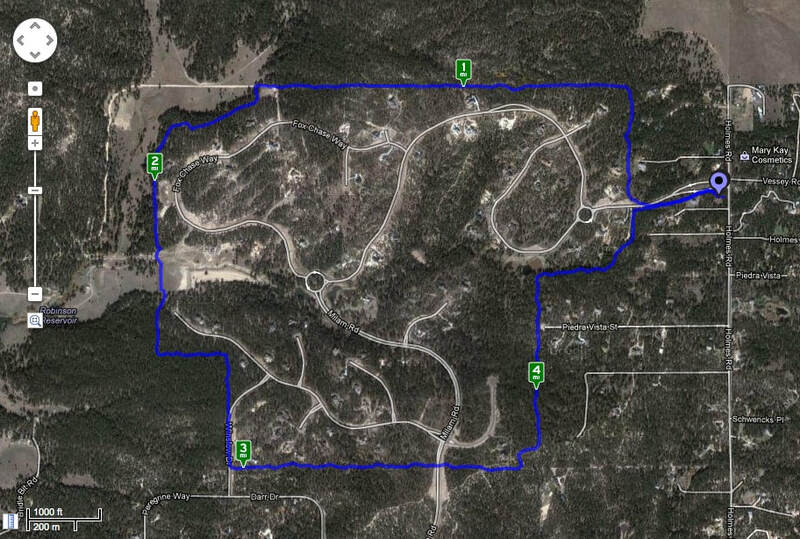 The Pikes Peak Loop is a 5 mile trail in the Cathedral Pines area (Holmes and Vessey). This is a beautiful trail in the trees with a nice combination of shade and open areas. The trail winds through the Cathedral Pines community, with many wild flowers, aspen and pine trees, and lots of peace and quiet. From Shoup Road go North on Holmes approximately 1.75 miles. Turn left on Vessey Rd into Cathedral Pines (there will be a large stone sign saying Cathedral Pines). Take an immediate left into a crushed blacktop parking area. There is plenty of room for multiple cars and horse trailers. From the parking lot on the North side (next to Vessey Road) there is an obvious path from the parking lot. Walk .27 miles on this dirt path to reach the loop. Accessibility: Trail is well maintained except for first .27 miles from the parking lot to the trail head. Strollers should have no issue on 98% of the trail. Other 2% is passable but not ideal. CLICK HERE to download the full trail map and info document.